“Go and be reconciled” said Jesus in his sermon on the mount. 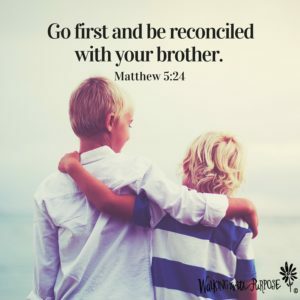 Reconciling with others is essential to the unity of the church. Before we give an offering in the plate we should sincerely give our hearts to one another. What does this mean? It means we should readily go to those we have hurt (or who have hurt us) and share the forgiveness that Jesus Christ gave us on the cross. Why? Because he did this purely out of divine mercy and love for us when we were lost in sin. St. Paul, ambassador of Christ, said: “God was reconciling the world to himself in Christ, not counting men’s sins against them. And he has committed to us the message of reconciliation” (2 Corinthians 5:19). All are cordially welcome to join with us for fellowship and worship!